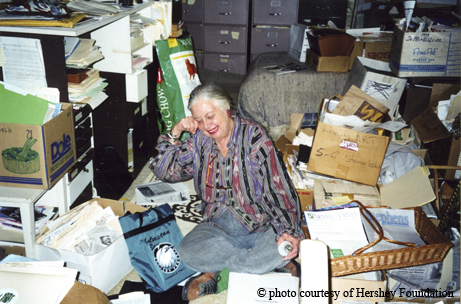 ﻿﻿﻿﻿Terry Hershey's environmental activism changed Houston and sparked conservation in Texas. One cause. One woman. Indomitable energy. It was enough to jump-start the Houston environmental movement in the mid-’60s and lay the groundwork for a generation of activists. Terese “Terry” Tarlton Hershey first got involved in what would become her life’s work in 1966. She and her neighbors observed a mess of fallen trees and bulldozed undergrowth along Buffalo Bayou and called county offices, expecting a remedy. She was outraged to learn that the Harris County Flood Control District and the Army Corps of Engineers were in the process of rerouting Buffalo Bayou without public notice. She was even more incensed when she realized officials planned to do nothing to stop the destruction. Hershey joined a fledgling organization called the Buffalo Bayou Preservation Association and soon became its most active member. She mobilized neighbors and community organizations. Hershey’s energy and persuasive style served her well in countless town meetings. She was quoted in the newspaper and interviewed on television, which continued to raise the profile of the issue and inspired many to get involved. After a barrage of press coverage and public outcry, the Harris County Commissioners Court agreed to a six-month moratorium on the project. Hershey and her allies continued to appeal at the federal level, and she turned to her newly elected congressman for help. George H.W. Bush began his first term in January 1967 and invited her to testify before Congress. They were successful in having the issue re-examined, and the destruction was halted. From 1967 to 1971, Hershey and her allies conducted community education campaigns and challenged the Army Corps of Engineers, the Harris County Flood Control District and the Commissioners Court at every turn. The campaign finally succeeded with the 1971 passage of the National Environmental Policy Act, which required the Army Corps of Engineers to seek public input and prepare environmental impact statements for significant projects. The Buffalo Bayou project that had precipitated Hershey’s plunge into environmental activism was canceled. But that was just a single victory. It would take another two decades of constant challenges for flood control approaches in Houston to consistently change for the better. During those 20 years, Hershey’s involvement and influence grew. The Buffalo Bayou Preservation Association morphed into the Bayou Preservation Association and became the watchdog organization of all 22 watersheds in the region. During that time, Hershey was one of 16 women who founded Citizens Who Care, the forerunner of the Citizens Environmental Coalition, which is still going strong today. She was also a founding member of The Park People Inc., which for more than 30 years worked tirelessly to advance the cause of parks and green space for Houston. She served on myriad local, state and national boards and garnered dozens of awards for her work. Hershey would modestly demur that she was but one of many active citizens who took part in environmental causes in Houston, but she was the catalyst for landmark initiatives as well as a persuasive, courageous and outspoken advocate for the issues she believed in. She nurtured a vast network of like-minded people and was known for the countless letters she wrote to keep the causes she cared about on the radar screens of the right people. When Ann Richards became Texas’ 45th governor in 1991, she appointed Hershey to the Texas Parks and Wild-life Commission, the first parks and environmental advocate ever to be appointed to the board. Hershey’s tenure got off to a rocky start at her very first meeting. After an endless series of commission agenda items about hunting regulations and programs, Hershey commented that “all of this talk makes me want to throw up.” The comment caused a firestorm of criticism, fueled by outdoor writers from some of the major newspapers in the state. At a subsequent meeting, a Dallas Morning News reporter presented Hershey with a barf bag signed by some of the outdoor writers who regularly covered the meetings, eliciting a peal of laughter from the new commissioner. She took it as a peace offering of sorts, and her reaction demonstrated her sense of humor. She displayed the bag in front of her the rest of that meeting, to the amusement of everyone in the hearing room. A conservation easement is an agreement between a landowner and a government agency or conservation organization that permanently limits uses of private land to protect its conservation value. Hershey had easements placed on her ranches in Stonewall and Colorado and hosted the first-ever conference on conservation easements in Texas. Now, conservation easements are a widely used tool to protect natural resources on private land. 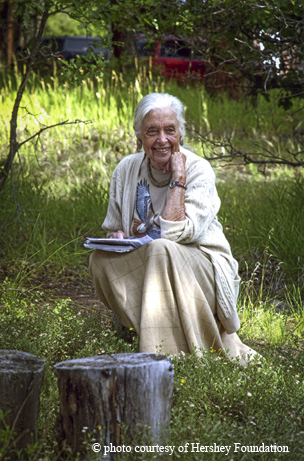 She also organized the first-ever land trust conference; today, there are dozens of land trusts across Texas. Terry Tomkins-Walsh was a doctoral student trying to focus her Ph.D. research when she met Terry Hershey in 2003. She was working with the Houston Endowment to advise Hershey on her collected papers and was surprised at the volume of material Hershey had stockpiled. “I bolted out of bed at 3 a.m. and realized ‘There’s a dissertation in that house!’” Tomkins-Walsh says. For the next few years she spent every Friday with Hershey, processing her papers and working on a dissertation about the history of Houston’s environmental activism. That connection led to access to the Citizens Environmental Coalition papers, and those papers formed the nucleus of the Houston History Archives, which Tomkins-Walsh now manages. Thanks to her work, fueled by the encouragement and cooperation of Terry Hershey, the legacy of environ-mental activism in Houston has been chronicled and will be preserved. President Bush reflected on Terry Hershey’s service to Houston in the late 1990s and called her “a force of nature.” It is a fitting description. Hershey has served as an inspiration and role model, and personifies the contributions that women have made to protect Texas’ natural resources. It has been a largely unheralded story. Hershey has a park named after her in Houston, and now her legacy will live for years to come in another way as Audubon Texas and Houston Audubon have named an award in her honor. In February 2015, the first annual Audubon’s Texas Women in Conservation awards luncheon will be held in Houston, and the Terry Hershey Award will be bestowed on an inaugural set of honorees. The award recognizes women who have shown extraordinary leadership and achievement in conservation in Texas.